The world of education is changing by the hour and we at Edutech are trying to implement that transformation in the most seamless and flexible way possible. Our custom-built learning platforms of FabLabs, Innovation Hubs and Makerspaces formulate the evolution of education technology with innovation and creativity at its very base. We offer an exclusive range of state of the art technological resources that promote creativity, collaborative learning and develop critical thinking and problem-solving skills in an innovative and stimulating environment. Edutech assists in the layout design, fit out, modular furniture, branding, equipment, technologies, consumables and curriculum resources for these learning spaces. These educational spaces designed for project based learning can include cutting-edge technologies for design and construction – such as 3D printers, laser cutters, hand tools, electronics, robotics, prototyping and more. 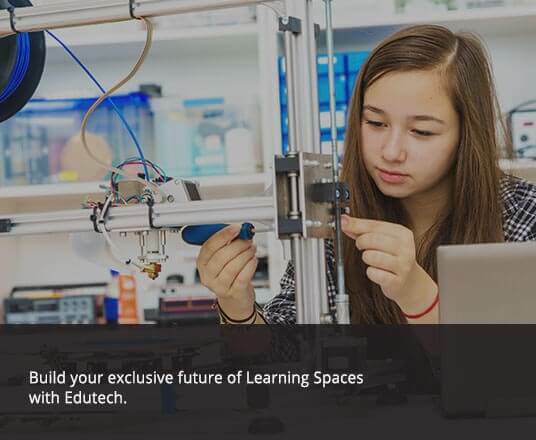 Learn more about how Edutech can create customised Learning environments of FabLabs, Innovation Hubs & Makerspaces for your institution.